[. . .] The question of defending the line of the Party, in all its aspects, is vital to the people of our country and to international communism. Let us speak here as Marxists, not as the leaders of a small state. As Marxists we have the right to have our say, to defend communism, just as much as the Soviets and any other Marxist-Leninist party, big or small. It is not a matter of conceit on our part when we say that we are defending and assisting the cause of international communism by our consistent, correct stand. Marxists have a proper understanding of this. Those who are not Marxists and conceal their anti-Marxist, bourgeois views might sneer: "Who are you to make such claims that you are defending international communism? You carry no weight with us." But it does not worry us what others may say, just as it doesn't worry us that they call us "dogmatic," "sectarian," and other such epithets that do not fit our Party. The line of our Party has been correct and Marxist-Leninist. It has been tested in practice for nearly 20 years, in the daily struggle for the liberation of the Fatherland, for the construction of socialism, for the defense of Marxism-Leninism from enemies of every hue and from the Yugoslav revisionists. The great successes our people have achieved, the great changes Albania has undergone in the economic, political, cultural and other fields have proved this. The Albanian people speak with admiration of all these achievements. With our people, the main thing to be seen is their conviction, their correct understanding that it is Marxism-Leninism, the correct Marxist-Leninist line of our Party, that has brought them these major economic, cultural and social transformations. This is of very great importance, and this is proved by the very close ties of our Party with the people. Thus, the life and work of our Party show that its line is correct, it has found the approval and support of our people, and it is neither dogmatic nor sectarian. We reject this epithet they apply to us — today under their breath or tomorrow at the top of their voices — and we will continue on our Marxist-Leninist road. Those who attempt to do such things are doomed to failure. Life and the struggle will expose them. It is not only our Party members and our people who speak with admiration about the correct line of our Party, about the great achievements of our country, but also the communist and workers' parties of many countries of the world. They speak in this way because of the fact that the Party of Labor of Albania liberated the country and set it on the road of progress, on the road of socialism. They see the great vitality and the heroism of the Albanian people and our Party, who are weathering all these storms with great determination. Therefore nobody, not even Liri Belishova, should think that this admiration by communists all over the world for our small but heroic Party is due to Khrushchev. By no means. If it were up to Khrushchev and the present Soviet leadership, Albania would not be what it is today, and the esteem and admiration the other parties have for our Party and country would not exist. Here we are in the Central Committee, therefore it is correct that the discussion should be frank and Marxist. Liri Belishova may be surprised by the open allusions we have made on some occasions in the meetings of the Political Bureau. We have said, for example, that there are party leaders who value the leadership of another party by the quantity of potatoes or tomatoes produced, and not on the basis of the political line it pursues. Liri Belishova has interjected, "How can you speak about these comrades like this?" We have told her that we are speaking about them on the basis of facts, here in the Central Committee and not in the marketplace, and we speak frankly. However, the time will come when these thoughts and opinions, along with other facts drawn from life, will certainly be voiced at international conferences as well. 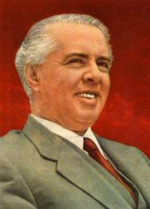 Many other parties have supported the Party of Labor of Albania in its resolute stand toward modern revisionism, especially against Yugoslav revisionism. This shows that there are really great and sound forces in these parties, although the worm of revisionism has penetrated into the leadership of some of them and is gnawing away at them from within. Nevertheless, it is very difficul t to subdue the Marxist-Leninist forces that exist in all the parties. They have understood our stand regardless of the fact that we have not come out openly against the mistakes of the Soviet leaders. Liri Belishova should not think that this is a tactic to protect Khrushchev — not by any means. We have always fought against revisionism, and will continue to do so. International communism has seen that we are against Khrushchev, and the true Marxist-Leninists have appreciated the correct stand and tactics of our Party. Our stand has been correct, and because of this nobody has dared to attack us openly; nevertheless, attempts have been made, and they are mounting to the level of threats, pressure and blackmail, but we have put them in their place. Then they resorted to the tactic of discrediting the Party of Labor of Albania. In what way? They tell us, "You are shouting and screaming so much against revisionism, that this is making them feel unduly important." This has been whispered around all the leaderships of the countries of the people's democracies and has even reached the leaderships of some communist parties of Western Europe. But what they say has no foundation. In fact, this is a call to phase out the struggle against Yugoslav revisionism. Now these tactics are continuing. It has been changed in form and will be turned into open attacks against our Party because we did not fall into line as the Soviet leadership desired, that is to say, we followed another road. But none of these tactics succeeded in intimidating our Party, and there is no force that can do so, even if they do call us "dogmatic," "sectarian," or "narrow-minded nationalists," and try to lead us into a blind alley. The strength of our Party and its Central Committee proves this. It is clear that the attempts to set us on that road are in vain. This is not a matter of respect . We do respect and love the peoples of the Soviet Union, but not Pospyelov.1 As long as he remained on the Marxist-Leninist road, we had respect for him, but now that he maintains such an anti-Marxist attitude toward our Party, we say to him, "Please stop!" When he can find not the slightest violation of Marxism on our part, why should he tell us to "Read Lenin!" That is what he said to our ambassador in Moscow, Comrade Nesti Nase, who has stood up to the attacks by Pospyelov very well. We want the disagreements between parties to be settled in a correct way. But they have not made, and do not want to make, any effort to settle these disagreements. But that is not all: Pospyelov should know that Marxism-Leninism teaches us that talks should not be held behind the back of another party, that a comrade's mistakes should be spoken about openly, according to Marxist-Leninist rules. What respect should we have for those who act differently? If you defend Marxism-Leninism, you should be consistent to the end. And we say to Pospyelov: "You have read Lenin all your life, but facts are showing that now you are distorting him." The question of the correctness of the line of the Party throughout its existence is clear. Has our Party been wrong over the Yugoslav questions? Facts have shown that it has not been wrong. Others have made mistakes, and first of all Khrushchev. He is not sufficiently a Marxist to have the courage to say, "I have been wrong." Since he has made mistakes, he should turn around and make a self-criticism and say, "I have accused Stalin of having been wrong about the Yugoslavs." Life has proved that Stalin was right. Then, if you are a Marxist, come out and say that Stalin was not wrong about these questions. What does it mean when we are told that we should keep quiet and not expose the Yugoslav revisionists, since that would allegedly give them undue importance? This means we should be quiet, because if you speak out against the Yugoslav revisionists, the worthlessness of others will be brought to light, too, since not only the Yugoslavs are revisionists. If you sharpen the struggle against the Yugoslav revisionists, this will open your eyes to other revisionist elements, too, in whatever form they may present themselves. The Czech leaders say: "Your Party takes a stand against the revisionists, but why does it not also take a stand against the Communist Party of China, which doesn't respect the principles of coexistence?" But why should we condemn the Communist Party of China? What is the line of our Party on this question? We are for peaceful coexistence, but when Lenin spoke about coexistence, he did not advise us to kiss and embrace the representatives of the monopoly bourgeoisie. If you see a film they have produced of late, it will certainly revolt you. This film which, it seems, is called SOS shows how a Soviet seaman and a collective farmer go and live together, I gather, with a British multimillionaire. His daughter gives the collective farmer the best room, and falls in love with the Soviet seaman, while the British lord drives his drunken son-in-law out of his house, and so on and so forth. We are for peaceful coexistence; not for coexistence such as that represented in the film, but for Leninist coexistence, so that we can expose imperialism and revisionism, expose any manoeuver and attempt of theirs to destroy us. Their aim is to destroy communism, our aim is to destroy imperialism and its agency, revisionism. We want to coexist, for example, with Greece, and why not? But we do not want to give Greece Gjirokastra and Korça,2 which the chauvinists covet — in no way! We can by no means make concessions to the Greek chauvinists under the guise of peaceful coexistence. Tomorrow, Khrushchev may even award the Peace Medal to such people who harbor annexationist aims toward us, but we shall take up these questions at the coming meeting. We are not for opening our doors to American spies, to decadent art and the American way of life. No, we are not for this road. With our ideology, we should fight all the manoeuvers and condemn the plans and the line of reconciliation with bourgeois ideology. Imperialism aims at destroying our countries not only by means of violence, but also by means of its ideology, its theater, its music, its ballet, its press and television, etc. We do not understand coexistence as the propagation of the American way of life. We do not approve of Czech or Soviet officials giving receptions and dances a la Americana in their embassies. The comrades representing our country abroad have been scandalized by such manifestations. We are not for such a road. We have told Mikoyan, too, that they should revise their view of the border question between China and India. We say to them that if the Greeks cross our borders at Gramos,3 we shall certainly not sit back with arms folded. And the Chinese took the same stand with the Indians. But now the Soviets are accusing China of warmongering and of not consulting anybody about their activity. But whom did the Soviets consult on the Cuban question, when they stated that if the United States attacked Cuba, the Soviet Union would retaliate against the United States with missiles? In the first place, if there is war over Cuba, all of us will be involved in it. Second, if the Soviet leaders respect the other countries of our camp, at least they must consult us about such important steps. Certainly, Cuba is the country of a people who have fought. But if the Soviet leaders consider their stand in defending Cuba as correct, then why should they accuse China over the question of Taiwan, a large island of 10-12 million inhabitants and of great strategic importance? On this island, which is an integral part of China, the U.S. 7th Fleet has established a lair. Why should China be patient and not demand the return of its territory? However, China has not lost patience but, on our part, efforts and pressure should be exerted on imperialism because we are a great force. We and the Chinese both say that our camp is strong, but it is another matter if, because of an opportunist line in understanding peaceful coexistence, questions of such major importance are neglected, and not only national ones but those connected with the strengthening of our entire camp. It is altogether wrong to fail to show the proper concern over the interests of great China. They may say that they have raised their voice for this purpose in the United Nations Organization, but how many other situations are there in which we can speak of defending the interests of China? It is said in all quarters that our camp is monolithic and united, etc. But we know very well that the existence of such grave differences in our camp is not a good thing at all. And if attempts are not made in a Marxist-Leninist way to eliminate these differences, then the Soviet leaders will embark on a very dangerous revisionist course. Who must bear the blame for this? We have demanded that the Marxist-Leninist norms must be respected in the relations between parties. The Soviet leaders accuse us of allegedly putting great stress on form and dealing with matters in a stereotyped way. But the questions we have raised are not matters of form. Khrushchev went four times to Brioni (Yugoslavia) to talk with the Yugoslavs about the Hungarian question. Why didn't he talk it over, at least once, with us, and why was there no meeting of the parties, members of the Information Bureau, held at that time, in which the voice of our Party could also have been heard and we could have reported about the manoeuvers of the Yugoslav revisionists, so that the other parties could have profited from this experience? Is this just a matter of form?! Why was the very important question of Poland solved in a bilateral way? Our Party has taken a correct stand on al l these situations; otherwise they would have attacked it directly. However , the attack came following the Bucharest Meeting. Up to that time the Soviet leaders had nothing bad to say about the line of our Party, except in connection with the stern attitude which we maintained toward the Yugoslav revisionists, that we were allegedly "hot-blooded", etc. But now our Party has become, according to them, "sectarian", and "narrowly nationalist." But we are neither sectarian, nor nationalist, nor dogmatic, but Marxists. The correct line of our Party has been tested by life, by our struggle; hence it enjoys the sympathy of all the communists throughout the world, and this encourages us to march forward. These questions have been and remain clear. We shall make them more concrete, and will stress that nobody has any reason to accuse China, and that we are against the accusations that have been made against her. The opportunist and revisionist mistakes of the Soviet leaders and others will also emerge [. . .] . 1. Pyotr N. Pospyelov, Deputy Member of the Presidium of the CC of the CPSU. 2. Regions in Southern Albania. 3. A mountain on the Albanian border with Greece.